Katherine Smith is the 2nd place winner of Streetlight Magazine’s 2018 Flash Fiction Contest. 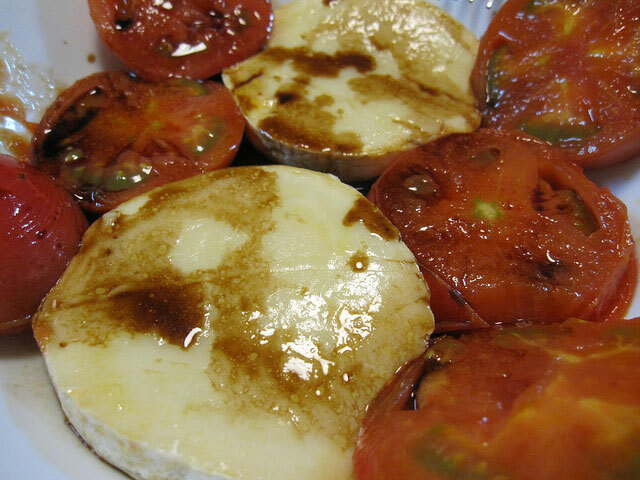 Camembert and Tomato Baked by Toyohara. CC license. The coffee was bitter and good in La Palette, Carol’s favored café off the Boulevard Saint Germain. Ten years before, a twenty-two-year old student, she’d eaten the same sandwich she ate now, baguette with camembert and thinly sliced tomato. Then as now the waiter had ever so slightly wrinkled his nose at the American proclivity to eat cheese with vegetables. Ten years ago, she’d cared just a little more what the waiter thought, with a slight, pleasant ripple of guilt. She’d pause writing an essay for her Art and Literature class at Paris VII, dripping tomato seeds onto the paper, smearing ink. Ten years later, she barely registered the waiter’s disapproval. She observed the French women in their light summer clothing walking from the market on the Rue de Seine, their bags bulging with summer fruits: plums, cherries, and figs. The street was awash in the faint smell of rotting fruit. Carol ate her tomato and cheese sandwich. Her belly was still tender. Just a week ago she’d had a job, her first real career in the states. After years of school and more years of searching, she’d finally got a teaching job in Maryland, had saved some money, turned towards finding love. She’d met a man in Baltimore, a young artist with a chronic illness. His spine was disintegrating into his bloodstream. Every morning he rose from her body to swallow a palmful of caplets that would delay the inevitable collapse of his skeleton. For now, the pills were working. They made love and went to breakfast in Baltimore, watched pelicans and cormorants dive for fish in the doomed waters of the Chesapeake Bay, visited a cypress swamp. They forgot the rigors of the work each had spent a lifetime preparing for. The salt breezes soothed them. Then she—feeling flu-ish one day—had gone to her primary care physician. When he’d suggested a pregnancy exam, she’d laughed. She was on the pill. He used a condom. She’d agreed to the test without much thought. The test came back positive, the doctor congratulated her as he typed his report into the computer. “Do you want to continue with me or would you prefer to be referred to an obstetrician?” He handed her a list of approved doctors. An official report would be made to the U.S. Department of Public Women and Child Safety. She was three weeks pregnant. She hadn’t even missed a period yet. In nine months, another report would be made by her doctor to the Department of Safety, showing a live birth. If she miscarried, her case manager would show up to open an investigation. Suspicious cases went through the court system. Her doctor would make regular reports to the Department of Safety. Carol berated herself for not doing the pregnancy test at home like any American woman with half a brain, for having said yes to the doctor’s offer so quickly. It hadn’t occurred to her she might be pregnant. Now it was too late. Carol never told her lover about the pregnancy. She herself would face prison time for terminating a pregnancy without government approval. She loved her partner too much to involve him in the crime she was about to commit. She bought a plane ticket to Paris with her small savings. She scheduled the procedure for the week she arrived. A cheerful woman doctor handed her a pill. The next day it was over. So here she was at La Palette. She couldn’t go home. She’d be arrested at the airport, first on misdemeanor charges for missing her four-week ultrasound, then for murder. In the next few days she’d report to the City Hall of the thirteenth arrondisement–where she was staying in an Air BnB. The long process of seeking asylum would begin. After the ban was issued two years ago, the French had welcomed American women. But Le Monde was already reporting French fatigue with the crowds of American asylum seekers, mostly professional women with whom the world had little time, women who competed with war refugees, victims of drought and famine and flood. Sympathy was waning. It would be hard for Carol to get asylum. For now, she ate the last crumbs of her tomato and cheese sandwich at the Palette in the sun. For a few last minutes she felt pleasantly adrift, a tourist, rich with the protections of a democratic nation. Then she’d remember the Department of Safety, the computer system that was on the scent of her and her unborn fetus. She watched the French women with envy, walking past her in their light summer clothing. She didn’t dare go home. 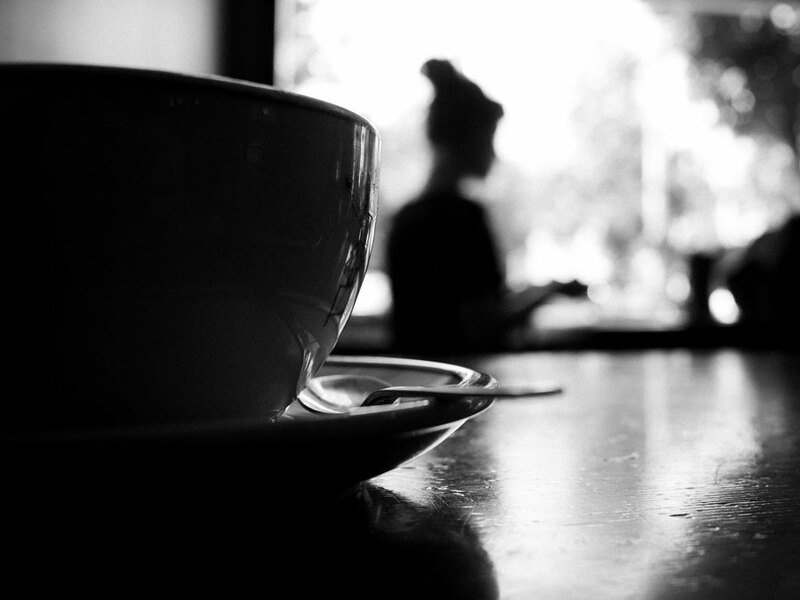 Woman in a café by Warfield (mostly away) (flickr.com). CC license. 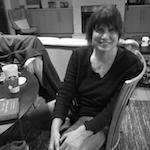 Katherine Smith’s publications include appearances in Poetry, Cincinnati Review, Missouri Review, Ploughshares, Southern Review and many other journals. Her short fiction has appeared in Fiction International and Gargoyle. Her first book Argument by Design (Washington Writers’ Publishing House) appeared in 2003. Her second book of poems, Woman Alone on the Mountain (Iris Press), appeared in 2014. She teaches at Montgomery College in Maryland.